Proving that a Ferrari can be practical, the GTC4 Lusso does something few other Ferraris can: carry a family of four. Don’t let that practicality fool you, though, as this four-seater is everything you would expect from the Prancing Pony and more. Up front, you have a 680 horsepower V-12 that, while more subtle than its supercar brethren, is nothing less than breathtaking. From a throaty idle to an 8,000-rpm bellow, there are gobs of torquey power to pull you through the curves or launch you into orbit with a top speed of over 200 mph. 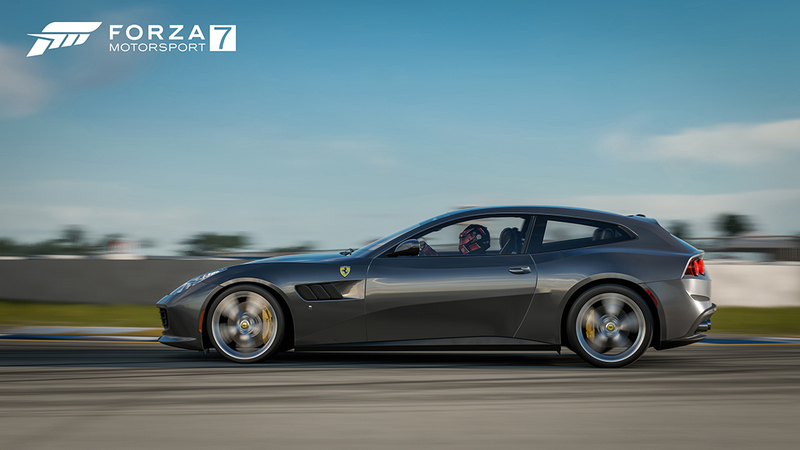 There’s also rear wheel steering taken from the F12tdf that will help the car to rotate into corners with poise. In Italian, lusso means “luxury” but there’s more than just creature comforts here. The GTC4 is a thrill ride for the whole family, no matter if the destination is the local grocer or the switchbacks of the nearest mountain pass. Forza livery creators have some new tools to work with in the February update, as we’ve made some significant improvements to the paint space. First and foremost, the paint space itself now features four user-selectable lighting scenarios – Ambient Light, Ambient Dark, Sunny, and Sunset. This gives the players the ability to view their liveries in a variety of lighting environments, perfect for highlighting those problem areas in a design. In addition, we’ve brought the functionality of Forzavista into the paint space; now players can open doors and hoods, get inside the car, and quickly spin around their car to see how a design is flowing. We’ve also added Photo Mode to the Paint Space; which can be accessed within the Forzavista option in the Paint Space. This update also adds a Free Camera system in the main garage (accessible via Forzavista), which allows unobstructed movement around the garage home space while in Photo Mode. This month, we’ve introduced a Force Feedback (FFB) update for wheel users. This update addresses issues that were causing latency between the physics frame and the FFB frame, which manifested as oscillation. With this update, wheel users will feel less oscillation and hitching in wheel FFB. In addition to these features and changes, we have made some back-end improvements that will improve load times into multiplayer races. These improvements will save players anywhere from 10-30 seconds during a load into a 24-car race. For the full list of improvements and fixes coming with the February update, check out our full Release Notes on the Forza Support site [LINK TO Release Notes]. New #Forzathon events have already begun in Forza Motorsport 7, with a great lineup of events and rewards coming throughout the month of February. 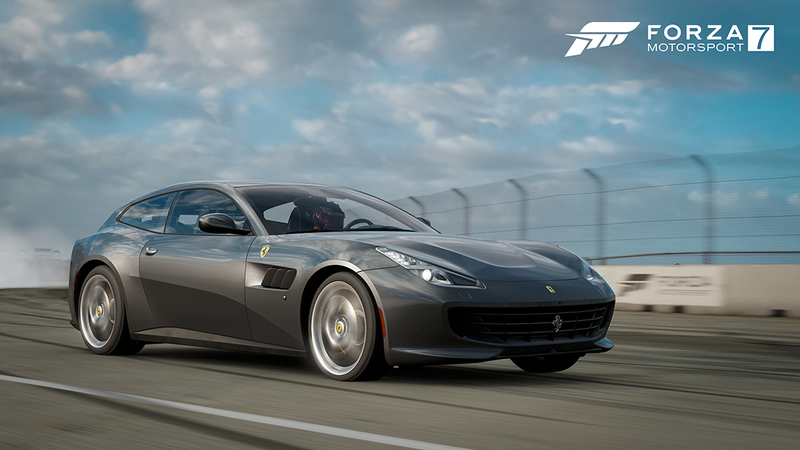 Look for cars like the 2010 Maserati Gran Turismo S Forza Edition, the 1987 Ferrari F40, the 1946 Ford Super Deluxe Woody Wagon Forza Edition and more up for grabs, as well nearly 1 million in-game credits available to win across all of February’s events. Our February crop of Rivals events have also kicked off. Forza 7 VIPs have access to a new event in the 1997 Maserati Ghibli Cup on Dubai. Over in Leagues, we’ve got our current “Keeping Pace” season happening now, featuring divisions like Formula 90s, Forza Touring Cars, and more, along with sweet rewards like the 1968 Dodge Dart HEMI Super Stock Forza Edition, among others.